Arturia make some of the best virtual synth and drum machines on the market. Their patches fit perfectly in audio with very little processing. Now they’ve ventured furthered into the plugin market with 3 Compressors. 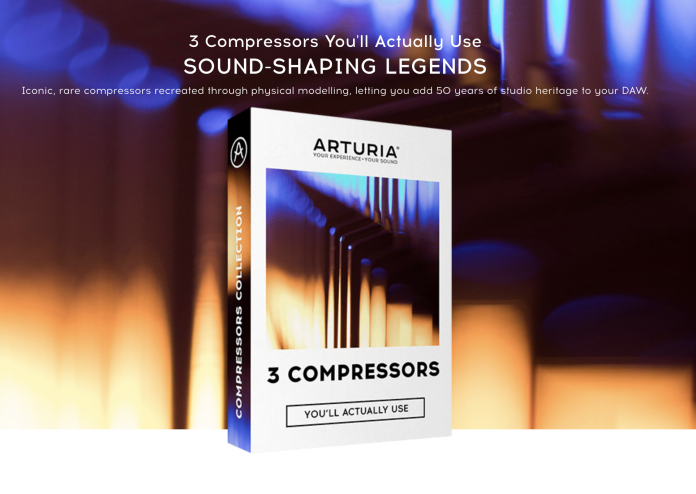 Following the success of their debut software effects in 2018, modelling experts Arturia have launched a software bundle of iconic compressor recreations. Bringing 3 rare, highly-prized studio hardware compressors into the digital domain using their exclusive TAE® modelling technology, Arturia are putting the awesome sound-shaping abilities of these industry legends to a whole new generation of producers. Following the “You’ll Actually Use” ethos of their previous releases, the effects found within 3 Compressors You’ll Actually Use are as direct as the title of the bundle: simple to use, powerful, timeless effects. Accurately modelled from the originals, each plugin offers its own unique flavor of compression and analog signal path, from subtle saturation to slammed, pumping grit and everything in between. Not only do these plugins sound fantastic, they’ve also been updated with subtle, optional modern touches like mid-side processed sidechaining and one-knob parallel compression to make great sounding audio easier than ever. Arturia have used the same expertise and technology behind the much-loved, award-winning instruments of V Collection to let anyone add some legendary studio hardware compressors to their arsenal. Accurately and painstakingly modelled on classics from Gates, Universal Audio, and DBX, these legends of the 50s and 60s have been given the breath of life, ready to face the challenges of modern music production. Each compressor also features great sounding presets from skilled studio engineers, as well as useful sound design tips and level recommendations to get each compressor sounding its best in your tracks. To celebrate the launch of 3 Compressors You’ll Actually Use , the plugin bundles will be available at special introductory price. Owners of Arturia V Collection, or any other Arturia software or hardware instruments are also encouraged to log in to their MyArturia accounts on the Arturia website to take advantage of exclusive crossgrade deals.